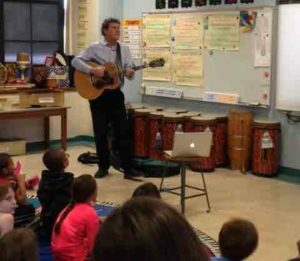 James Hersch, music artist, worked with all 2nd,3rd,4th and 5th graders at Davenport’s Jackson Elementary for two days. Each group had two writing sessions with him. On the first day, James reviewed vocabulary related to King Tut and different types of music. Students provided preferences and ideas of general knowledge about Egypt, mummies, the pyramids etc. By the end of day one, every group had written at least a refrain and verse for their specific song. On the second day, the songs were refined by adding improvisation and at least two more verses. By the end of the second day James introduced the students to live recording and two recordings were made of each song. It was amazing to see how each group created individual and unique songs although the subject matter was the same for each group. James Hersch also worked with 3rd, 4th and 5th graders at Davenport’s McKinley Elementary for two days. One day began concentrating on getting ideas and beginning the process of putting them together, The second day was for finishing the ideas/song and recording. The 3rd grade created a song about the concepts the children had studied in Science this year. 4th grade chose the topic, “Our 4th Grade Year,” and 5th grade wrote about the culmination of their McKinley years.James first gave them music choices: i.e. tempo/key/special effects/ and style. James Hersch is a master of pulling ideas from the students and working out ideas on the spot. Students get the experience of writing and rewriting/ literature/song form/ and rhymes that make sense in the contest of their piece and in stretching their vocabulary. He would say: “We already used that word, how can we say it a different way?” He took ideas from everyone, making sure everyone got a part in the song-writing process. The students were excited to work with him and he brought the best out of each child. Students collaborated in a way that is different from traditional classroom writing exercises. James Hersch worked with ease even with some of our most challenging students. He promoted music making in a whole new light as the students realized they were writing the lyrics to an original song that was not only entertaining, but told a story, too. He took ideas from everyone, making sure everyone got a part in the song-writing process. Each song reflects the interactions of the students and James throughout the process. We are excited to have the CD and look forward to performing the songs at our final all school assembly at the end of May.